Looking for an appropriate instrument locker for your Tri-Toms or Field Drums? This is the perfect space for many different kinds of instruments. 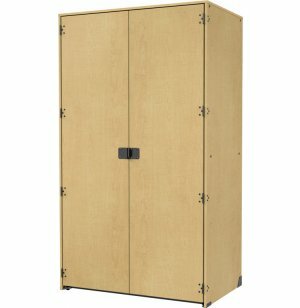 There is nothing like some solid instrument lockers to really keep your band room organized. Unlike other brands which make you order enhancements separately, the Band-Stor collection from Marco Group offers a number bonus features that come standard as part of their instrument storage. Polyethylene shelf liners keep air flowing below instruments and cases to prevent moisture and dust buildup, and the front and back of each shelf is supported by a steel tube for extra durability. 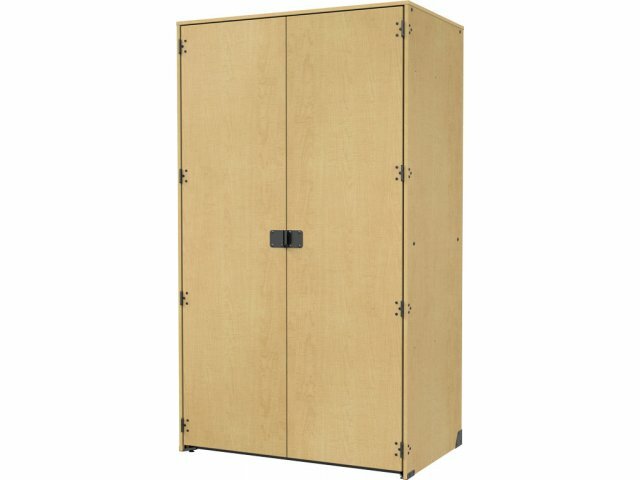 These instrument lockers have solid doors for the ultimate security. A thumb catch and heavy-duty hardware keep them securely closed. For locking storage, simply add a padlock to keep your instruments as secure as possible. As an added convenience, internal levelers let you adjust your cabinet without removing contents or re-positioning them. 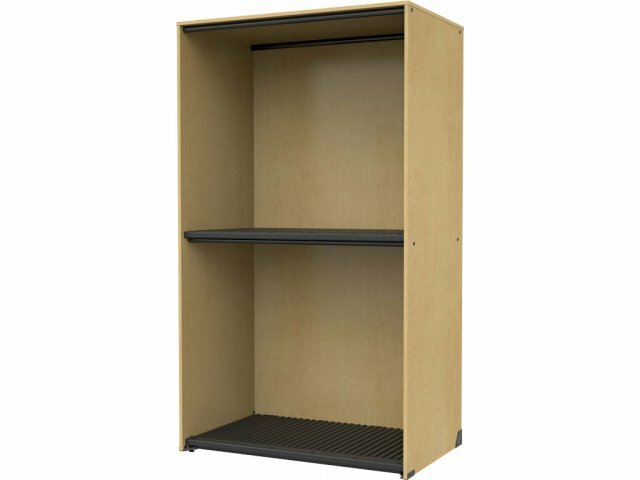 With so many exceptional features, your students and band leaders will be singing the praises of this music instrument storage for many years to come. Perfect Fit: Stores 2 Bass Drums, Field Drums, Snare Drums, Parade Drums, Tri-Toms, Quads, Tubas, Sousaphones or general storage. Enhanced Support: Steel tubes provide extra support to the front and back of every shelf. Shelf Liners: Polyethylene shelf liners are ridged for ventilation, allowing air circulation under instruments or cases. Caps secure liners firmly in place. Automatic Close: Thumb catch automatically engages when doors close. Locking Option: Accommodates a combination padlock. 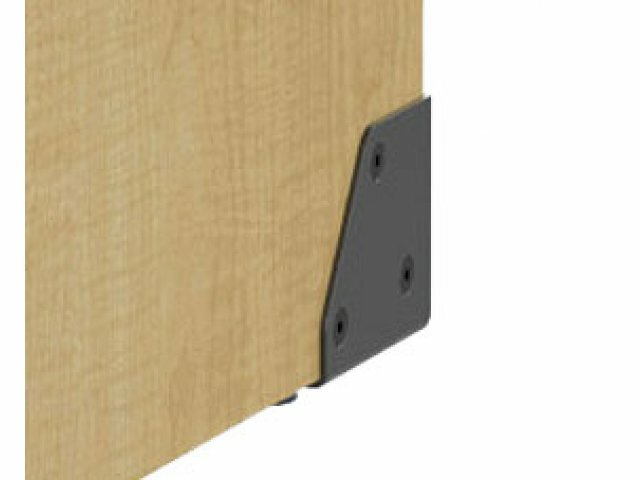 Durable Construction: Heavy-duty bolt-through hardware keeps hinges securely positioned. Smooth Surfaces: Thermofused melamine has a sleek appeal. Resists Damage: The 3MM PVC edge banding prevents damage from moisture. Super Sturdy: Steel rear gable plates provide extra reinforcement. Convenient Design: Internal levelers let you adjust from inside the cabinet without moving and tilting cabinets. Custom Cabinets: See our exclusive band storage checklist to create a custom cabinet that fits your instruments perfectly. No Hassle: Ships fully assembled.